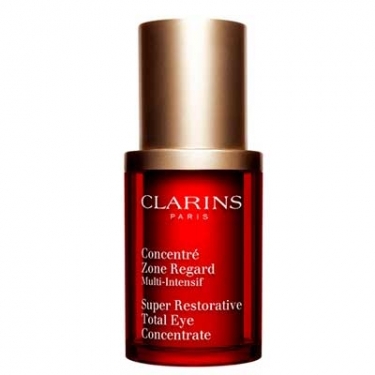 NAME: Clarins Concentre Zone Regard Multi-Int. Clarins Concentre Zone Regard Multi-Int. is a richly concentrated eye cream to instantly lift and rejuvenates your eyes. Nourishes and hydrates the delicate eye area. Contains Pueraria lobata, dermaxyl®, caffeine, Shea butter, and parsley. Apply morning and/or evening to cleansed skin. Massage gently to eye contour and eyelids and light sweeping motions between the eyebrows and on the temples.